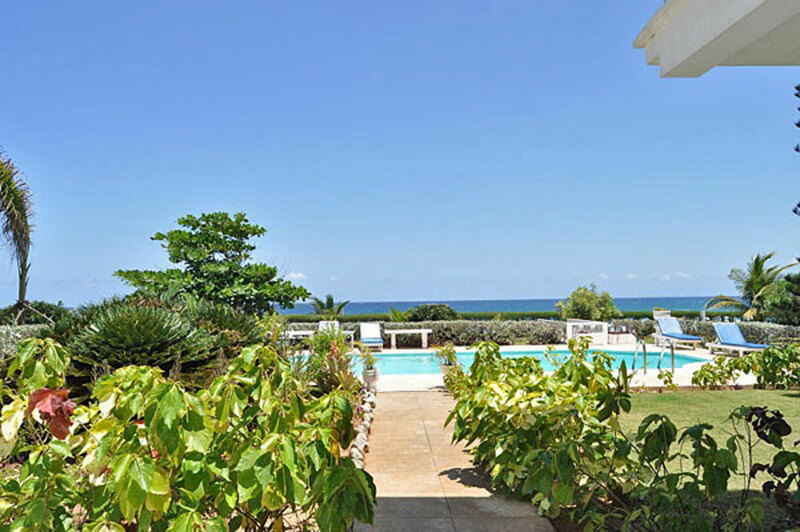 Kima Villa is located on the North Coast in exclusive Mammee Bay and looking out to the town of Ocho Rios. Kima Villa's well manicured landscaped has a lovely Caribbean feel, that is instantly felt when entering the open beamed ceiling (25 ft) living/dining room. You always feel the outdoors are at your finger tips with the large louvered doors that open the room up to the pool, sea, bar and veranda which in cludes comfortable outdoor furniture. Kima Villa is a warm and charming 3 bedroom/3 bath villa. All the bedrooms are bright and breezy, with large windows. The bedrooms face either out to the sea or to the large freshwater swimming pool. The spacious living room is tastefully furnished with lovely tropical soft furnishings. There is a wet bar and high bar chairs for drinks and socializing. You can either dine indoors or outdoors on the open veranda which faces the grassy area and sea. The gardens and pool area offer great views of Ocho Rios across the bay. You can relax in the hammock under a shady tree while you watch a volleyball game and listen to the sea breeze. There is no swimming right off the property due to the rocky area to the sea, but just take a short 5-min walk down a private road to excelent swimming and water sports on the beautiful, white, sandy Mammee Bay Beach and you can also grab a drink or light meal at the Beach Bar/Cafe. Bedrooms: 3 spacious A/C bedrooms all with A/C, ceiling fan and en-suite bathrooms. Two are on the first floor and are handicap accessable. Bedroom 1: second floor with king-size bed, en-suite bathroom, air conditioning, and balcony overlooking the sea and pool. Bedroom 2: downstairs with king bed, en-suite bathroom, air conditioning, and patio with views of the sea and pool. Bedroom 3: downstairs 2 twin bedrooms, with air conditioning, and adjoining bathroom. Kima has a full staff of four; cook, housekeeper, laundress and gardener.